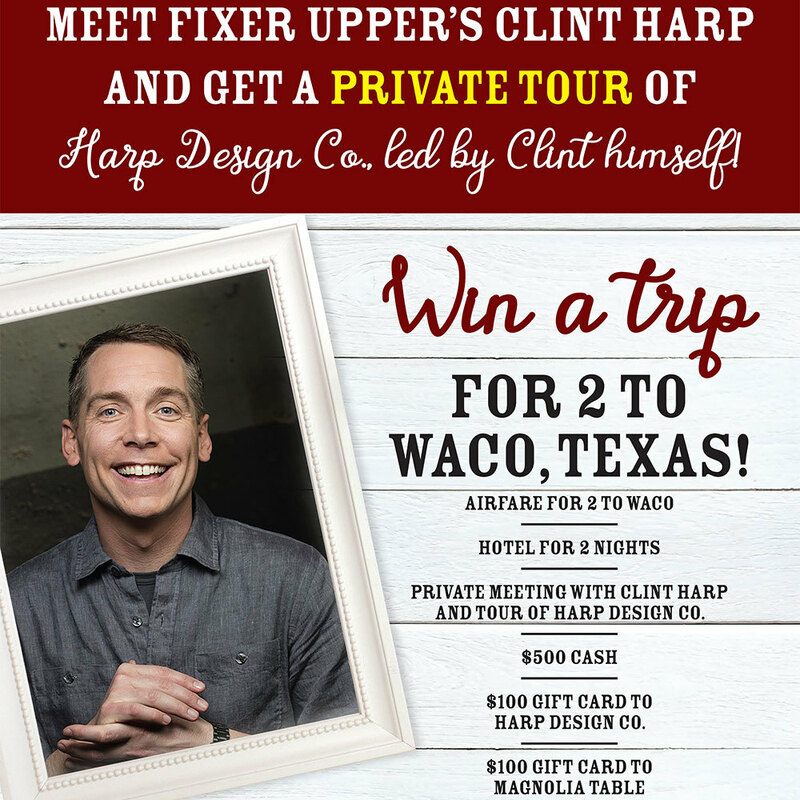 Enter to win a unique experience courtesy of Clint Harp and Marketplace Events! Plus, 10 lucky winners will each receive a signed copy of Clint Harp's Handcrafted. The more actions you complete, the more chances you have to win. Yep, it's that easy. Complete the following actions to receive one additional entry each! Sign up to receive emails from Marketplace Events partners. This sweepstakes is in no way affiliated with or endorsed by Facebook. One  Grand Prize winner will be chosen randomly on or after April 15, 2019 from a list of entries received between 12:00 a.m., Eastern Time (“ET”) November 15, 2018 and 11:59 p.m. ET on April 15, 2019. This sweepstakes is open to legal residents of the forty-eight  contiguous United States and the District of Columbia, who have reached the ago of majority in his or her state or territory of residence as of the Sweepstakes start date. The Grand Prize winner will receive a trip package for winner and one  guest to Waco, Texas, the Trip package includes round trip, coach air transportation (from major airport nearest winner's residence as determined by Sponsor in its sole discretion) to Waco, Texas along with 2-night hotel accommodations (one room, double occupancy). Also included is $500 cash to help cover car rental and/or ground transportation costs, a $100 gift certificate to Harp Design Co., and a $100 gift certificate to Magnolia Table. The trip must take place sometime May - September, 2019. Ten (10) First Prize Winners will each receive a signed copy of “Handcrafted”, Clint Harp’s new book to be published in the fall of 2018. ARV of prize is $50. Total Prize Pool ARV is $2,500.